This year, a massive wildfire destroyed more than 42,000 acres in Chile’s Torres del Paine National Park, which UNESCO declared a Biosphere Reserve in 1978. This tragedy inspired the creation of REFOREST PATAGONIA. Patagonia Sur has 1,000,000 native-species trees, and has decided to dedicate its stock to the restoration of Torres del Paine and other protected areas in Chilean Patagonia. Patagonia Sur has planted nearly half a million trees in the southernmost regions of Chile, becoming the country’s leader in native reforestation. JOIN THE MOST AMBITIOUS NATIVE-SPECIES REFORESTATION CAMPAIGN IN CHILE’S HISTORY. 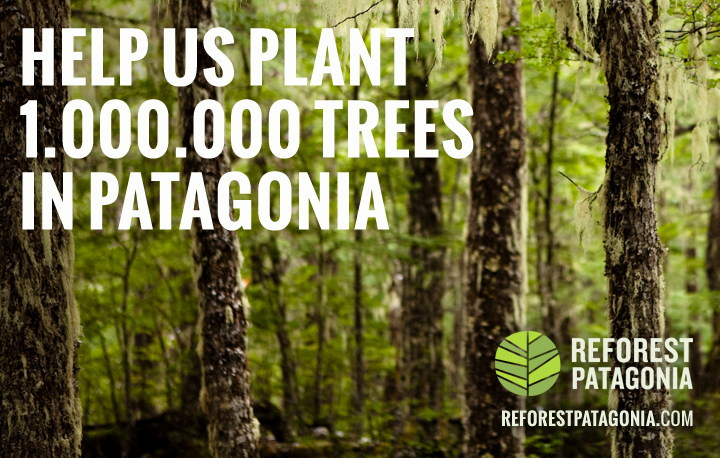 Reforest Patagonia is a public-private partnership between the Government of Chile and Patagonia Sur, creating an international initiative to reforest one million native trees in some of the most scenically remarkable and ecologically valuable areas in Chile. Visit http://www.ReforestPatagonia.com where for only $4 US dollars per tree, individuals and companies can plant trees virtually in Patagonia. In return, on our end, we’ll plant one real native-species tree (Lenga, Coigue, Nirre) for every virtual tree you support. Use your social networks and communications platforms to involve your friends, family, clients and employees in this historic reforestation project.